MosChip understands a fleet management organization’s profitability is dependent on multiple factors, including eff­icient customer service, maximum fleet utilization, minimum downtimes, and e­ffective asset life cycle management. MosChip’s GeoHEMS can help your business improve its eff­iciency and maximize profitability. GeoHEMS provides businesses with the vehicle’s exact location, hours of operation, and provides service maintenance reminders. Whether you are a commercial fleet, government fleet or over-the-road fleet management company, MosChip’s Fleet Management Solution provides asset tracking and advanced monitoring tools to virtually control your fleet from anywhere. Receive automatic maintenance schedule alerts to minimize the break-down and operational. Get reports on daily fuel consumed, average fuel consumption etc and minimize your operational cost & fuel. Manage your fleet on the go from anywhere using our GeoHEMs Mobile App. Get daily/weekly/monthly reports on fuel consumed, furl used, trips taken etc on a single dashboard. Know the actual location of your fleet with the integrated Digital Maps. Temperature monitoring made easy for temperature sensitive product transportation. 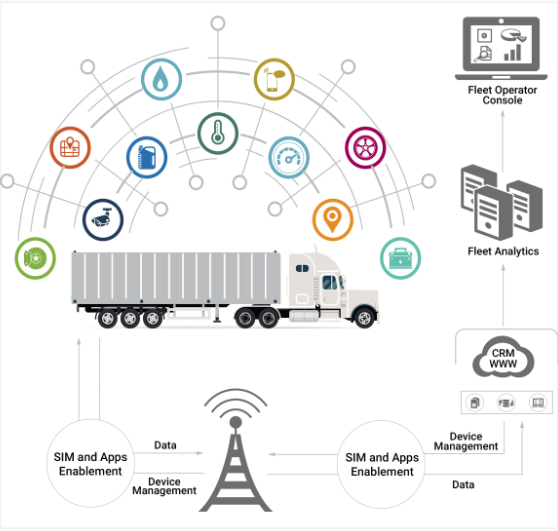 By optimizing the fuel efficiency, monitoring the health of the vehicles, real-time tracking, streamline reports, improved routing and managing driver’s performance can help Fleet managers to reduce their operating costs and increase the profitability. Receive daily/weekly/monthly reports on fuel consumed, fuel thefts, short-fills, trips taken, routes taken, operational hours, idle hours, KMPL, engine hour reports. Our reports let you identify the trends of your fleet helping you to make better and informed business decisions. Remotely monitor all your fleets using a single dashboard. Get real-time location tracking, Geofencing, and routing with our Fleet Management Solutions. Set benchmarks and get instant alerts when those are breached. Track your fleet live using our Fleet Management Solution using our desktop dashboard or our mobile app. Track the unauthorized use, arrival time, unscheduled stops and the route taken by the driver. Use Geofencing to track the exact number of stops and time spend at each location – thus increasing daily customer stops. Cut down on unauthorized use by monitoring zones around driver’s homes. If you have existing ERP/SAP/Transport Management systems and you use those for customer billing, you can integrate GeoHEMS with it. Integration with SAP TM module for 3PLs that helps in improved transportation/ parcel /tariff planning, improved use of assets, multi-resource scheduling resulting in better decision-making capabilities. Re-usable electronic tags (RFID / BLE) to track individual assets, support for camera – useful for transportation of high value goods. Integration with sensors like lid open, temperature, door open etc. special goods.